We chose this cruise because of the 11 day duration and the destinations. 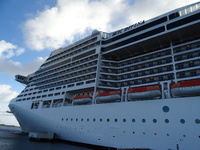 The ship itself is amazing and huge - we are first timers so we were awed by the dimensions. Getting in is well organised but long and a bit difficult at times. The room was very quaint and nice, small for a family of four but we knew that when we reserved. Everything was quite handy in the room and we were happy being together. The guests on board vary, majority from Italy, US, Eastern Europe Czech and Hungary, Brazil - all over the place, it&apos;s truly international. The other positives were the food in the buffet which was excellent - perhaps the best buffets I have come across in a long time. Everything was super fresh, pizza was delicious, so were the pastas. Felt no need to go to Eataly with the standard of food so high. Salads and fruits were plenty and varied. Got slightly bored after a week and decided to go for the Far Eastern sushi place which was also nice, although sushi quality was just ok. The biggest letdown in food was the main restaurant where we should have dined every night from 6PM. Went once, super busy, waiters not on top of their game at all, half hour for a glass of wine, not friendly waiters at all, very confused and rushed service. The quality of the food was also poor compared to the buffet. Prawn cocktail, lobster bisque, vegetable soup, and others were a joke at best. I wasn&apos;t aware of how big the pools were on board, but they should be at least 50% larger if possible to accomodate the people. Not sure if this is technically possible, but I would go for bigger pools and less hot tubs. Although the hot tubs were almost always full with 10 people minimum. Internet usage is a ripoff, I must have spent 500 dollars for using the net with my family - constantly had to check how many MB remain. Also, the daily per person service charge that I only found out about on board is a huge ripoff. Much better to give tip to staff that actually do their job well. Like our cleaners - wonderful guys, always smiling and doing up our room 5 times a day and hoovering even at 9 PM. Kids programs - we couldn&apos;t get our 7, 10 year olds to go to programs, because they couldn&apos;t attend the 11+ group where the games were more to their liking. I understand this of course, but age 4-11 is too wide unfortunately and involves drawing and lego which they didn&apos;t want to take part in. Tips: - reserve beds with towels early. You shouldn&apos;t do that on paper, but this is not enforced by staff at all and you are left without a sunbed after 9 AM. - go to buffet rather than fixed dinner. What is the point of getting substandard food with rushed impersonal service and also have to dress up in dinner jackets and stuff each night? - go see the plays, the entertainment is really quality with some great voices - reserve your own excursions on shore. they are cheaper and last much longer than the boats organised trips. The duration of these are 4 hours max and you spend at least 8 on shore, so why not hire a car, do your own thing? - check credit card for all extra charges added on - do not get a drinks package unless you want to drink more than 2 cocktails and 3 beers a day. especially given the fact that you will be paying for drinks all day when you get off on the islands. We chose this cruise because of the 11 day duration and the destinations. 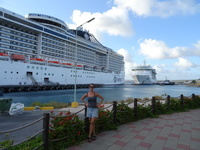 The ship itself is amazing and huge - we are first timers so we were awed by the dimensions. Getting in is well organised but long and a bit difficult at times. The room was very quaint and nice, small for a family of four but we knew that when we reserved. Everything was quite handy in the room and we were happy being together. The guests on board vary, majority from Italy, US, Eastern Europe Czech and Hungary, Brazil - all over the place, it&apos;s truly international. The other positives were the food in the buffet which was excellent - perhaps the best buffets I have come across in a long time. Everything was super fresh, pizza was delicious, so were the pastas. Felt no need to go to Eataly with the standard of food so high. Salads and fruits were plenty and varied. Got slightly bored after a week and decided to go for the Far Eastern sushi place which was also nice, although sushi quality was just ok. The biggest letdown in food was the main restaurant where we should have dined every night from 6PM. Went once, super busy, waiters not on top of their game at all, half hour for a glass of wine, not friendly waiters at all, very confused and rushed service. The quality of the food was also poor compared to the buffet. Prawn cocktail, lobster bisque, vegetable soup, and others were a joke at best. I wasn&apos;t aware of how big the pools were on board, but they should be at least 50% larger if possible to accomodate the people. Not sure if this is technically possible, but I would go for bigger pools and less hot tubs. Although the hot tubs were almost always full with 10 people minimum. Internet usage is a ripoff, I must have spent 500 dollars for using the net with my family - constantly had to check how many MB remain. Also, the daily per person service charge that I only found out about on board is a huge ripoff. Much better to give tip to staff that actually do their job well. Like our cleaners - wonderful guys, always smiling and doing up our room 5 times a day and hoovering even at 9 PM. Kids programs - we couldn&apos;t get our 7, 10 year olds to go to programs, because they couldn&apos;t attend the 11+ group where the games were more to their liking. I understand this of course, but age 4-11 is too wide unfortunately and involves drawing and lego which they didn&apos;t want to take part in. - reserve beds with towels early. You shouldn&apos;t do that on paper, but this is not enforced by staff at all and you are left without a sunbed after 9 AM. - go to buffet rather than fixed dinner. What is the point of getting substandard food with rushed impersonal service and also have to dress up in dinner jackets and stuff each night? - reserve your own excursions on shore. they are cheaper and last much longer than the boats organised trips. The duration of these are 4 hours max and you spend at least 8 on shore, so why not hire a car, do your own thing? - do not get a drinks package unless you want to drink more than 2 cocktails and 3 beers a day. especially given the fact that you will be paying for drinks all day when you get off on the islands. Small for a family of four but nevertheless very comfortable and practical - everything was there within reach and the toilets had shelves and drawers to pack in. Once we got the life jackets under the bed and suitcases under the bed we had room to pack as well. Comfy bed, ok balcony. Rented a car, drove around the island, went to the Arikok park, sand dunes, caves, gold mine, fantastic! Ended up at Baby Beach, great food and beach time.